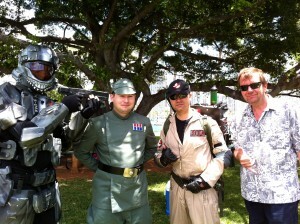 Hawaii Geek Meet V at Magic Island in Honolulu, Hawaii was a blast. 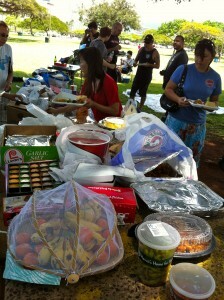 Geeks from around the Honolulu area came together for a beautiful day at Ala Moana Beach Park. Most of the attendees are affiliated with a group some might consider different or unusual. For us, we felt right at home. All we heard was “e komo mai.” Thanks for the warm welcome. We met current and new friends from Bytemarks, Costumers Guild of Hawaii, Institute for Astronomy, Pacific Outpost of the 501st Legion and Emergency Amateur Radio Club. One of the hams set up a HF radio and antenna right in the park up using a tree to boost his signal strenght. He chatted with other hams from around the world. An ono buffet flowed across several picnic tables including new the malasadas from Zippy‘s, healthier fresh fruit and everything in between was enough to tempt anyone’s taste buds. Large telescopes were trained on the the sun and we viewed sunspots or darker looking patches. Filters allowed viewing the sun without damaging our vision. Various mock battles erupted throughout the day as Ghostbusters took on Darth Vadar and his crew. Gladiators and Stormtroopers reeked havoc as they roamed the land. The Pacific Outpost 501st Legion are a costuming group dedicated to the awesome bad guys of Star Wars. 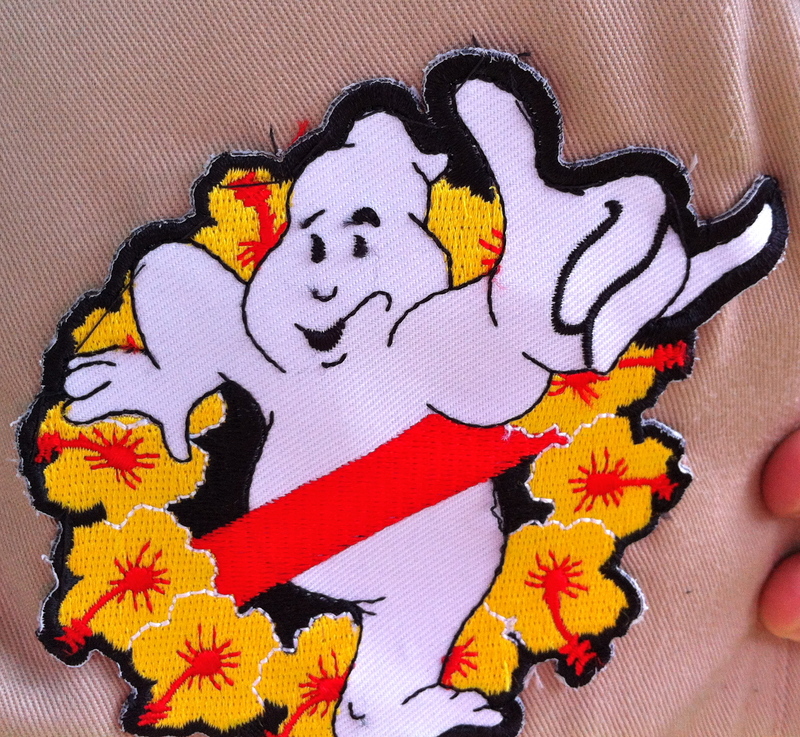 One of the members explained that Ghostbusters clubs from each state have their own patch. Above is the patch from the Hawaii Ghostbusters club. All in all, a day of fun on the beach. Pacific Outpost 501st Legion are a costuming group dedicated to the awesome bad guys of Star Wars.